On the sixth match of Pro Kabaddi League, the First match was between Haryana Steelers vs Gujarat Forunegiants. As we Know Haryana Steelers Lost their first match against Puneri Paltan. Gujarat Fortunegiants had a tie against Dabang Delhi K.C. So both teams were on the field to win their first match of Sonepat leg on day six of Pro Kabaddi league 2018. Haryana Steelers suffered a major blow when their captain and ace defender Surender Nada was ruled out for the remainder of Pro Kabaddi League2018 with a broken elbow. Haryana Steelers won the toss and selected choice of court. Haryana had totally dominated in first eight-minute with lead 6-0. Monu had been exceptional in his first three raids. Gujarat Fortunegiants were all out in 11 minutes with point 9-1, Haryana with 8 point lead. At halftime, Haryana Steelers lead with 7 points against Fortunegiants with score 20-13. This gave clear assumption of match result. Another 20 Minute of play helped Gujarat Fortunegiants to came near Haryana with Score 25-20. But from now Haryana got point at every minute with successful raid and at the end of the game score at the table was 32-25. Haryana steelers lead the match with 7 points and won their first match against Gujarat Fortunegiants. 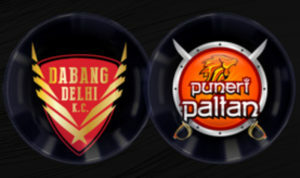 2nd match of the day: Puneri Paltan vs Dabang Delhi K.C. Let’s Look at some fact, Puneri Paltan’s first match resulted in a tie. Then in the second match they won. Dabang Delhi also went through the tie in their first match, and this was their second match let’s go through it. Puneri Paltan won the toss and selected choice of court. After the first three minute scores at the table were 3-3. Puneri Paltan Was out in their first 8 minutes with the score on table 5-11, Delhi Dabang lead with 6 points. Puneri Paltan came back with good spirit and Dabang Delhi was all out at 17-16 before halftime. At halftime Puneri Paltan ahead with 2 points against Delhi with 22-20 score on the table. Till now paltan was in lead but with one successful review score at table 25-25. Dabang Delhi was on the card to score a point at every minute and Puneri Paltan was all out at score 29-33. At last 3 minute score was 34-41, Puneri paltan tried everything for the end but they only got 3 points 37-41. As we assumed Dabang Delhi K.C. won their first match with 4 point lead and exciting match.